Whoopi Goldberg and Tyler Perry appeared on Watch What Happens Live With Andy Cohen to promote Nobody's Fool, which stars Goldberg and Tiffany Haddish. Andy Cohen asked about a possible Jumpin' Jack Flash sequel. Goldberg said, "No, because that's not the sequel I want to do!" Whoopi then revealed that she wants to make Sister Act 3. She went on to talk about Disney not wanting to make the film, which led Tyler Perry to chime in and say that he wants to make it with Goldberg and Tiffany Haddish. He said, "The two of them in Sister Act, that should happen. Let's make it happen." Once Tyler Perry revealed his wishes, the live audience went crazy. However, that was not all. Andy Cohen then asked Perry why he doesn't just try and buy the Sister Act 3 rights from Disney. Both Whoopi Goldberg and Perry said that they are going to try, but it might not be all that easy to do, no matter how much money the two can pool together. Disney seems intent on making a remake, which could interfere with a new sequel bringing back Goldberg's beloved Deloris Van Cartier character. 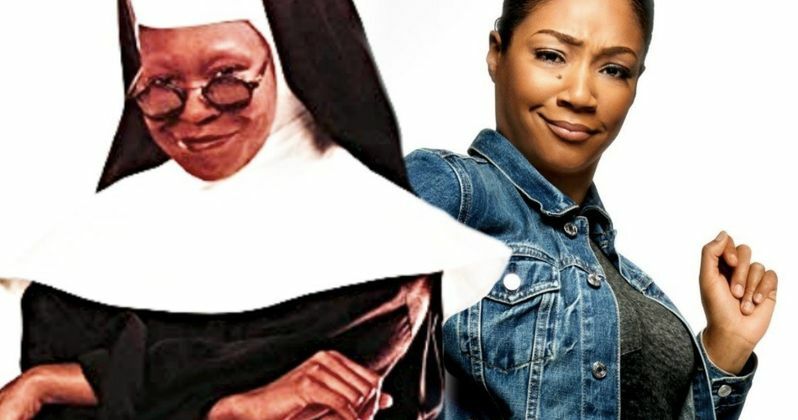 The thought of Whoopi Goldberg returning for Sister Act 3 is big enough on its own, but adding Tiffany Haddish and Tyler Perry to the equation is almost too much. With that kind of clout, Disney may decide to change their mind and let Perry and Goldberg make the movie that they want to make. As Andy Cohen says in the interview multiple times, "it's a no-brainer." Sister Act 3 would be a huge box office smash with those three on board. If adding Tyler Perry and Tiffany Haddish to Sister Act 3 isn't enough, Whoopi Goldberg would surely hit up Maggie Smith and Kathy Najimy to get in on the action as well, reuniting the original cast. Let's hope that the excitement of Perry, Haddish, and Goldberg working together begins to spread, letting Disney know how bad Sister Act fans want to see the sequel and not some remake with a bunch of new actors, rehashing a story that has already been told perfectly to begin with. You can watch the interview with Whoopi Goldberg and Tyler Perry below, thanks to the Watch What Happens Live with Andy Cohen YouTube channel.